In the Punta de la Barca, in the municipality of Muxía, it is a set of oscillating stones related to magical-religious cults in, very popular in the Camino de Santiago and visited by many pilgrims pre-Christian times. 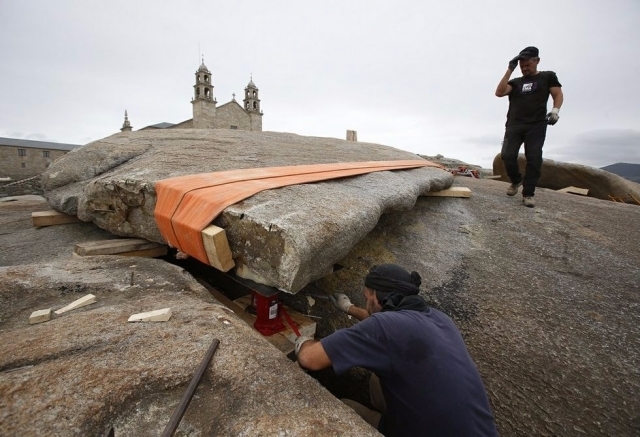 The Pedra de Abalar, about 80 tons, is one of the great attractions of this set has been study object by a group of coruñeses architects, having stopped swinging the monolith, despite having returned to its original place a team of archaeologists last July. The recent study has concluded that, although the stone is in its original position, and does not oscillate by the detachment of a piece after a storm in 2014, fully dissuading to repair it, as a dangerous rift inside could split it so final. The regional government decided a few weeks ago not to move the oscillating stone, and has proposed moving the piece to a nearby museum. These stones of great weight and size are called swinging or swaying that to be in balance sometimes a small force or the wind itself can make them move. You are credited with powers of divination and witchcraft relates them, healing or Druidism. Although found throughout the world, they have special anthropological relevance those located on the Atlantic coast of Galicia, France or Britain. Yo directamente la llevaría a un museo o a un lugar seguro. Dejarla ahí es peligroso, puede romper en cualquier momento y provocar daños. Si se repara se rompe, y si no se repara también... pues mal vamos.